Ensuring that the lights stay on and Canadian businesses can operate 24/7 is an essential public good provided by the country’s electricity sector. However, as with other sectors, electric utilities must innovate to meet the requirements of the modern age. Specifically, more than ever, environmental considerations are factoring into Federal, Provincial and Territorial governments’ expectations of electric utilities. And with over 80 per cent non-emitting generation and growing, the sector has responded to these concerns. However, it is also facing a number of disruptive forces. Declining average end-use consumption, the proliferation of distributed energy resources, and rising levels of competition all pose challenges for the electricity sector. In adapting to these challenges legislative roles and responsibilities exist for many regulators, but the tools available to address the changes and disruption vary widely across jurisdictions. And in sum, there is the feeling that the regulatory environment that electricity companies operate under has been slow to promote the level of innovation that is necessary to meet current and emerging challenges. Indeed, there are regulatory tests that seek to balance these competing interests (i.e. benefit-cost analysis frameworks), which exist today within the industry and provide a potential template. However, the devil is in the details when it comes to defining the benefits and costs that are included when cross-jurisdictional imperatives exist. It is also equally true that regulators are facing contrasting pressures of their own. For instance, I have yet to meet a regulator that does not recognize the public good that could result from utility innovation. Or, a regulator that does not realize we will need to adjust regulatory models and practices in order for utilities to overcome the challenges of the day. However, regulators also express being confronted by pressures to focus on ensuring that costs for utility consumers remain as low as possible. And given the tendency for this latter directive to contain political dimensions, there results a tendency for regulators not to approve or incent innovative or “outside of the box” thinking; and rather, to direct utilities to replace like for like, at the lowest possible cost. Thus, there is the feeling by many in the sector that there needs to be a longer term holistic view adopted that includes the impact of the status-quo on costs to consumers. In consideration of these discussions, in 2017 the Canadian Electricity Association commissioned Navigant Consulting (Navigant) to undertake research, with the goal being starting a conversation with regulators on how they can utilize specific regulatory tools to promote utility innovation and modernization. 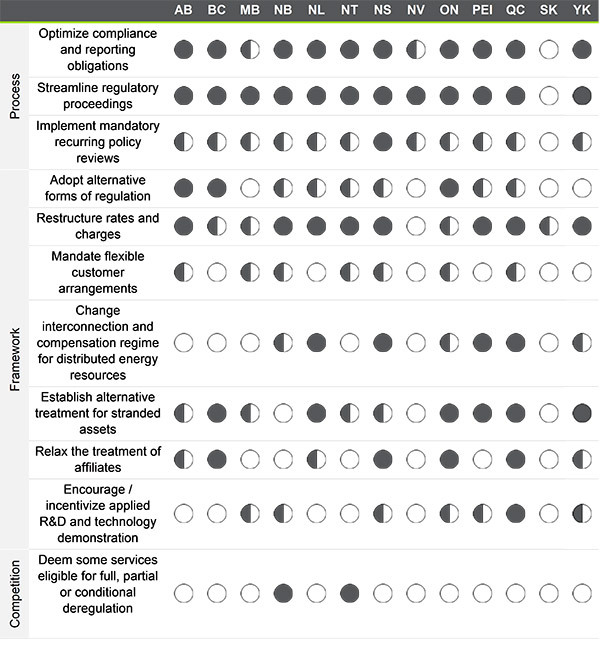 Navigant identified eleven levers and actions identified in Figure 1 below for regulators to consider when looking to address the technological disruption facing our sector. Navigant broke these into two broad categories: process reforms and framework reforms. A third category, “competition”, was also identified. Navigant then evaluated the regulatory permissibility of the toolkit options within each of the thirteen Canadian provinces and territories under the current statutory framework (See Figure 2). Regulator permissibility for each of the thirteen regulatory levers varies widely throughout Canada, ranging from Saskatchewan and Nunavut with minimal permissibility; to Quebec, Alberta, and Nova Scotia with considerable permissibility. Permissibility is represented graphically using shaded circles, where the extent of the shading represents the extent of the regulator’s discretion under existing legislation. It is evident from Navigant’s research that regulators have the most flexibility in actions and levers in the process category, followed by framework and competition. Additionally, most regulators also appear to have substantial flexibility in rate design and tariff structure areas in terms of introducing and changing policies. In short, there is some flexibility within the current legislation in most provinces and territories for regulators to adapt in the face of disruptions to the energy sector. Given the variances in the specific circumstances of each jurisdiction, options for adaption and evolution should be evaluated more thoroughly going forward. By releasing this research, the electricity sector aims to start a conversation on how electric utilities can be both incentivized to bring forward the non-traditional investments and activities necessary to adapt to the pressures discussed above. And also how regulators can utilize their full regulatory toolkits in order to enable the electricity sector to meet the challenges of the day. Navigant’s research, predictably, did not uncover a “silver bullet” uniformly available to regulators across the country to enable utility innovation and modernization. However, the report does show that there are at least some tools available to most provinces and territories, which vary by jurisdiction, that can be utilized by regulators towards these ends. CEA hopes that this work helps to further the conversation regarding how regulators can fully utilize these tools to enable the innovation and modernization that so many energy stakeholders recognize to be in the best interests of Canadians. By starting this conversation, we hope to find a solution; and begin to embark upon the Canadian energy future! * Francis Bradley is the Chief Operating Officer of the Canadian Electricity Association. 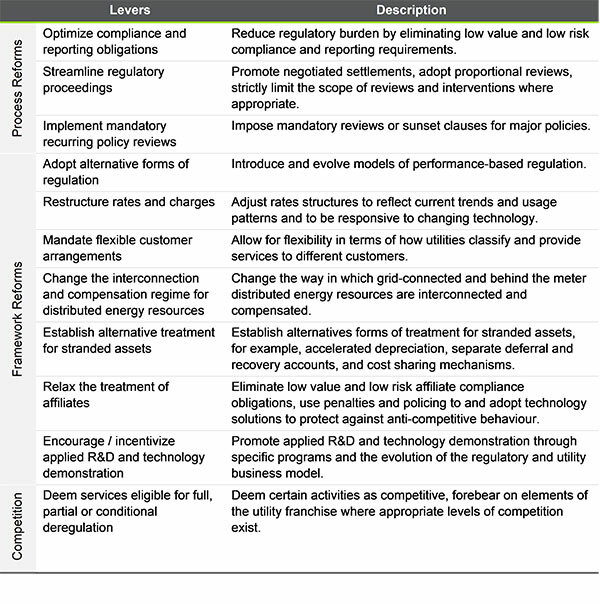 The Canadian Electricity Association, ‘’Starting a conversation: Is there flexibility to adapt Canada’s current utility regulation landscape?’’ (2018), Online: <https://electricity.ca/wp-content/uploads/2018/10/Navigant-Flexibility-to-Adapt-Regulation.pdf> at i-ii.